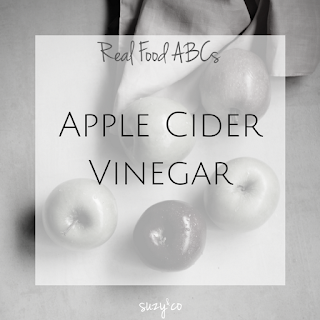 You know apples, you know apple cider, you know vinegar, but you might not be familiar when it all comes together as apple cider vinegar. Apple cider vinegar is a great item to add to your pantry for good health. Writing this post, I still felt that although I knew a bit about it, I was not aware of all the potential benefits. Apple cider vinegar is a fermented product made from apples. Apples are fermented to cider and then a second fermentation process turns the alcohol into vinegar. The reason I started using apple cider vinegar was for energy. I heard that a tablespoon in a glass of water in the afternoon could boost energy. For me, it really does work. Could it be a placebo? Sure. But even if it is, it is an easy, cheap way to get an energy boost. I have also used it as a hair rinse. In place of conditioner, rinse your hair with apple cider vinegar. It makes it really shiny and manageable. Many of these benefits may be more anecdotal than scientific, but I try to keep an open mind. Even if I am not sure the science completely backs it up, placebos aren't always a bad thing if they do not harm. The other nice thing is that since it is vinegar, it can be used just like any other vinegar: in salad dressings, cleaning bathrooms, for marinades, etc. So even if there are no health benefits that come about from trying it, at least it will not go wasted. "a natural cloudy substance found only in raw, unfiltered organic vinegar formed from naturally occurring, strand-like chains of protein enzyme molecules"
Let me know if you have experienced any positives from apple cider vinegar.